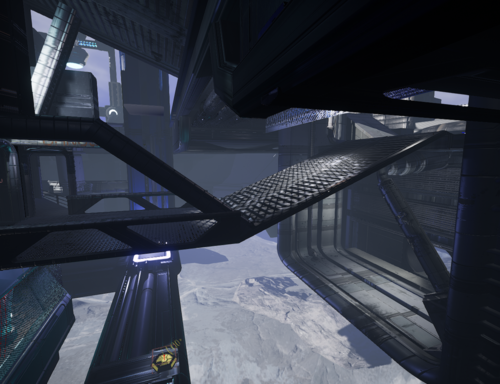 This is my second map released for Unreal Tournament (4), using the Unreal Engine 4. 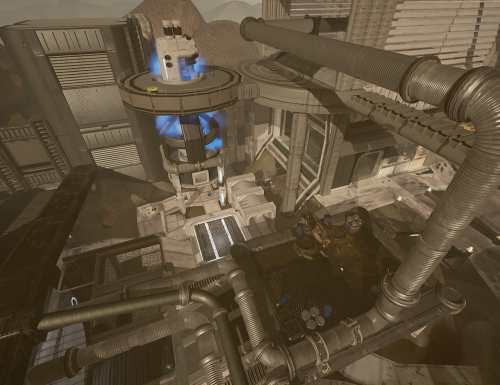 Meant to be played in Deathmatch or Elimination, it's a rather large map focused around a wall-enclosed lower compound with two main facilities on opposite sides. The arena takes place on a barren world within a functional but aging water plant constructed to catalyze and redistribute the fuel sources extracted from the local water lakes. You'll find at least two spawning points for all weapons -- as well as nearly every single type of powerup -- across the entire level. There are multiple elevators and jump-lifts that can be used to rapidly reach the upper locations, and in addition there are a variety of areas to both hide and snipe, with the general lighting dim enough that many locations are shadowed to prevent easy exposure. 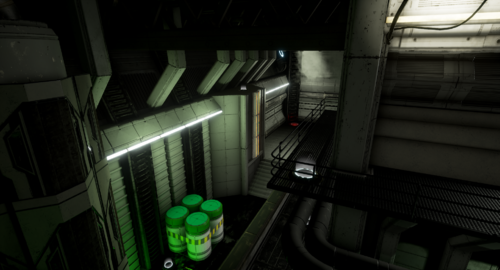 Completion of the level took about 50 days, with on-and-off development throughout the project. Please post feedback, such as bugs, performance rate, unaligned textures/meshes, or just general gameplay experience (flow of the level). <EDIT> Map has been updated and overhauled as of February 23rd, 2017. Look below at What's New in Version 3.0.0 for more updated details. Enjoy!  Path=/Game/RestrictedAssets/Maps/DM-Reservoir-V3 - MapRotation=/Game/RestrictedAssets/Maps/DM-Reservoir-V3 - PackageChecksum="6b8bb4b2831721f6e20ec4ba76ac9626"
This is my very first level for the Pre-Alpha of Unreal Tournament (4). Let me start off by saying this whole general process of Unreal level designing, uploading, distributing etc. is all very new to me, as I have only been using the Unreal Engine 4 for about 3-4 months, and there's bound to be some design errors and rookie mistakes for a while until I get the hang of it all. With that being said, here's Version 1 for CTF-Summit! An ambitious project for my first map, It's a rather large capture-the-flag level set in an aerial base over a frozen landscape. There are numerous ways to navigate up and down the level, and powerups are focused in the gas chamber at the central map, and two elevated platforms on the level's outskirts. Due to it's visuals (and large size) it might be a little rough on lower-end PCs, which is one of the reasons I want this tested. Bots might be inconsistent with their pathing as well. For me this is my entry into the level designing community of Unreal Tournament 4, and I would really like to present some standout levels, which means I need some critical feedback and honest opinions on my works (Don't be afraid to nitpick! Everything from the general map flow and bugs, to the lighting consistency, to the architecture such as pipe/floor trim placement can use criticism, and I would appreciate it if you don't hold back). I hope you enjoy, and let me know what you think.